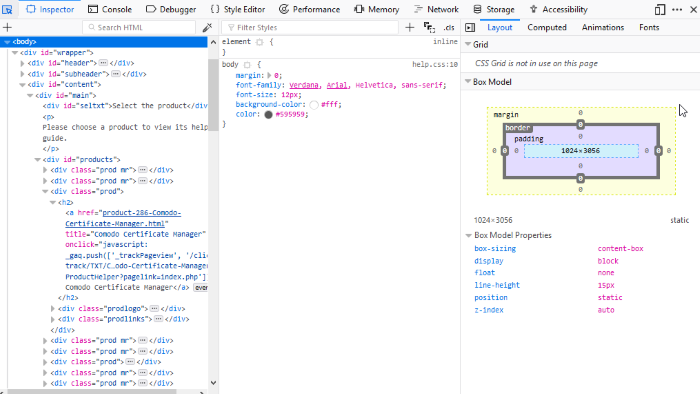 The 'Inspector' tool lets web developers analyze the layout and structure of a web page. Right-click on the page and select 'Inspect Element' from the context sensitive menu. You can right-click on specific items on the page to open the inspector at the relevant place. Move your mouse cursor over page content to view information about it in the inspector. Click on a page element if you want to work on it. The 'Inspector' consists of two parts: HTML pane and CSS pane. All parent elements are on the the left and child elements on the right. The left side pane is HTML pane – The top-level element in the hierarchy of all nested elements, is at the left of the toolbar. Allows you to view the HTML code of the selected element. Use the arrow keys in the left and right to navigate to the elements in the tool bar. Rules - Show all the rules that apply to the selected elements. The most recently applied styles are listed first. Styles are grouped by source. The 'inline' group lists styles applied using the HTML style attribute. Computed – Indicates the computed CSS for the specific element. Box Model' show the total space taken by the element on the page. It provides information about the currently selected page element's layout: the outside numbers displays an amount of padding is on each side of the element. The numbers in squares on the borders show the border of each side. The margins around the element and the center, is the size of the element's content. Layout – Apply a grid overlay while inspecting the element. Animations - Animations to specific element. Fonts - Displays all the fonts in use by the selected element.